A pre-World War II photo of cannery workers posed in solidarity. Industrial workers clasp arms in a 1930s poster that says “An injury to one is an injury to all.” Workers gather in a 1945 mural over a poster reading: “Build a free world. No masters, no slaves.” A recent snapshot of Seattle City Councilwoman Kshama Sawant and others campaigning for the $15 minimum wage. The Labor Archives of Washington was founded in 2010, funded in large part by the contributions of dozens of unions and hundreds of individuals involved in the Puget Sound labor movement, particularly the International Longshore and Warehouse Union and the Washington State Labor Council. It is a unit of the Special Collections area of UW Libraries. The labor archives are a collaborative project with the UW’s Harry Bridges Center for Labor Studies and UW Libraries. UW talents involved with planning and creating the archives include history professor James Gregory; political science professor Michael McCann, who directs the Harry Bridges Center; and Andrew Hedden, the center’s associate director; as well as Paul Constantine and Lizbeth Wilson of UW Libraries. 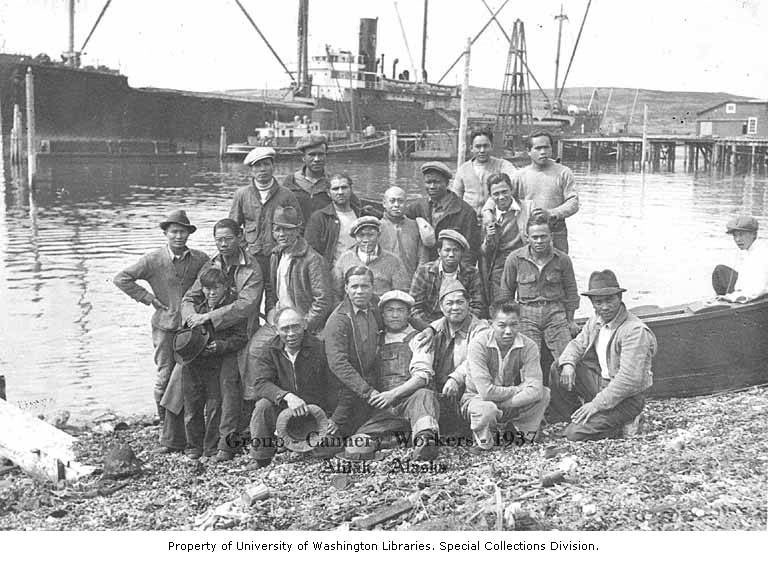 Others not with the UW involved with the creation of the archives included Eugene Vrana, retired labor archivist for the International Longshore and Warehouse Union; and Jeff Johnson, president of the Washington State Labor Council. These are among thousands of images, documents, records and more in the extensive Labor Archives of Washington, housed in the Special Collections area of UW Libraries. The archives are a collaborative project of the libraries with the Harry Bridges Center for Labor Studies. The archives are overseen by UW Labor Archivist Conor Casey with the help of with Crystal Rodgers, assistant labor archivist. With Labor Day approaching, UW News asked Casey to choose a dozen images that represent the variety and impact of the archives. The images are below, with captions written by Casey — who also answered a few questions about the archives and their important work. What is the formal mission of the labor archives? 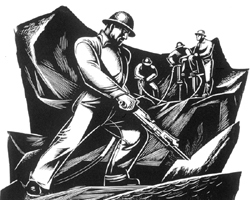 The Labor Archives of Washington was founded to collect, preserve, and create access to labor-related materials from individuals and organizations documenting the local, national, and international dimensions of the labor movement in the Pacific Northwest. The archives’ collections reveal the intersection between labor unions and social justice, civil rights, and political organizations that feature a labor relations or labor rights dimension as part of their focus. How extensive are the archives? How many items and categories? We have over 300 collection components, and about 3,000 cubic feet of materials — a cubic foot is about a copier paper box full of materials. We also have a lot of born-digital materials (meaning items that originated in digital form) including oral histories, curated websites and born-digital collections. How do items come to the archives? People and organizations often contact us seeking advice about how or where to preserve their historical materials. I have built ongoing relationships that yield new collections, and I initiate connections with people or organizations that include new collecting areas. As a subject expert on labor history and related topics, I’m aware of trends of scholarship in academic study and in activism and issue-based organizings. I incorporate anticipated research value in those trends in how I seek out and appraise new collections, what I prioritize for processing, and what we emphasize in our outreach activities. We work closely with faculty, students and researchers to understand how this history is being taught and what topics students are researching. This helps us set collecting, processing and outreach goals. I also use my knowledge of those areas to identify gaps and areas where we can strengthen our collections. We have been doing that with collections documenting female labor leaders, union members and occupations, public sector unions, communities of color — especially Filipinx and Latinx communities, and LGBTQ communities. These supplement and complement our traditional collection strengths in records documenting organized labor, European American workers, and traditionally male gendered occupations. What is the process when new items or collections are donated to the archives? Collections come to us in many ways. Donors may contact us directly, or they may be referred by community members or faculty. Some reach out to use the collections based on seeing media coverage on television, radio, podcasts, streaming video or our posts on social media. Our annual events and partnerships with other organizations and on-site and traveling exhibits generate donations as well. I may contact donors myself. 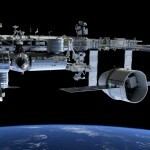 We are constantly trying to reach out to new audiences of users and donors. One new tool that we are using is a regional labor and labor-related records survey — Crystal is the point person for this — to understand what collections are out there, what types of materials there are, and what kinds of conditions they are stored in. This will eventually identify new collecting opportunities as well as identify areas of risk and need by our stakeholder communities. The mural “The Struggle Against Racial Discrimination” by Mexican muralist Pablo O’Higgins hangs in Kane Hall. The Labor Archives of Washington houses the records for the socially and politically progressive Ship Scalers' Union, for which it was painted, as well as the records of the attorney and activists who demanded it be restored and reinstalled after being nearly forgotten in storage in a UW warehouse. 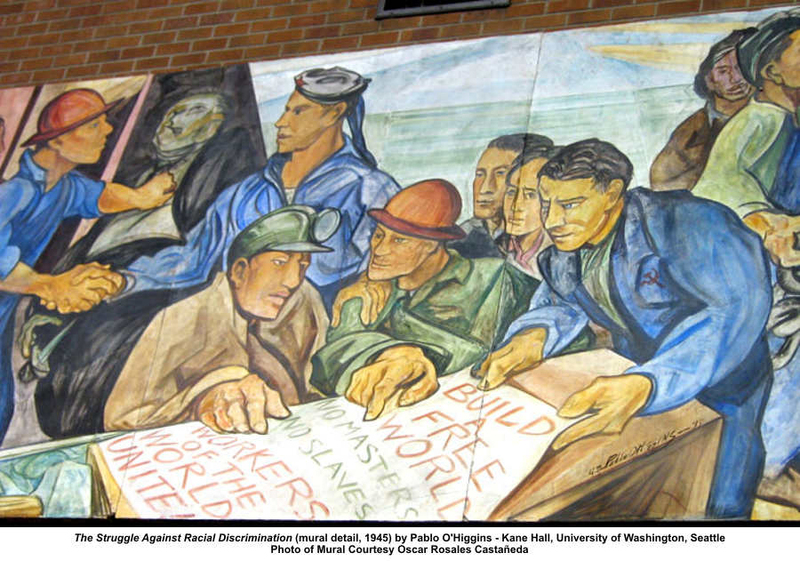 Photo of O'Higgins mural by Oscar Rosales Castañeda for the Seattle Civil Rights and Labor History Project. 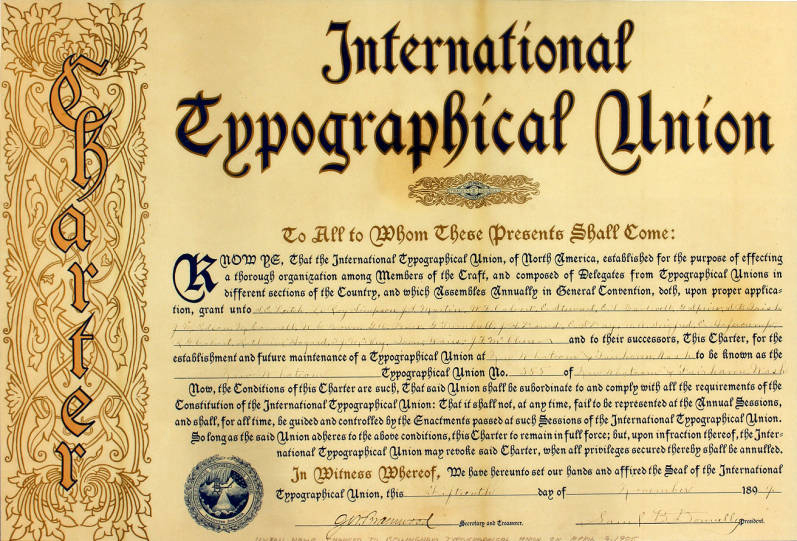 Chapter of the International Typographical Union. Locals of the union were often among the first organized by workers in the American West due to the highly skilled and in-demand nature of typesetting and printing work, which required literacy and a highly specialized skill set. From International Typographical Union, Local 99 records. Marchers carry lighted picket signs from SeaTac to Seattle in December 2013. The picketers symbolically connected the historic minimum wage victory in SeaTac to a mayor-created committee on a Seattle minimum wage. 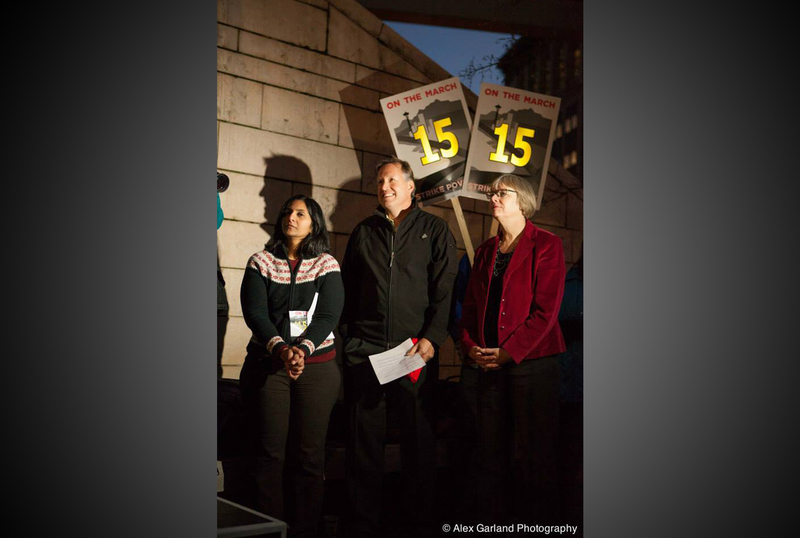 The minimum wage became a central issue of Seattle's mayoral and city council campaigns in 2012-2013, and was the origin of the national 15Now minimum wage movement that followed. Alex Garland, Working Washington Photograph Collection. 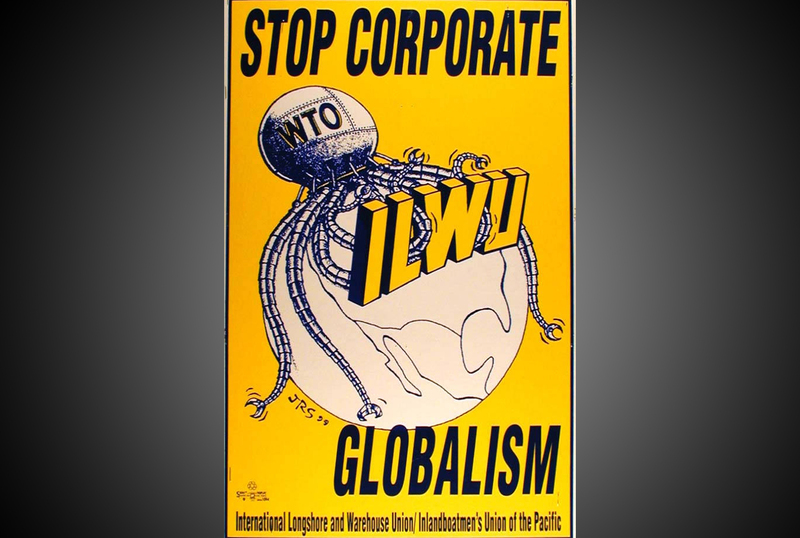 Members of the International Longshore and Warehouse Union carried this picket sign during the labor movement marches surrounding the World Trade Organization meeting in Seattle in 1999. Critics protested the undemocratic, non-transparent nature of the proceedings and resulting agreements, which omitted human rights, labor, environmental, and political protections in its provisions. From WTO History Collection. These International Workers of the World (IWW) stickerettes were also called “silent agitators” because they were meant to be adhered to any available surface to raise the class consciousness of workers about the IWW’s goal of abolishing corporate capitalism by organizing "One Big Union" that incorporated all workers regardless of trade, nationality, race, gender or faith. 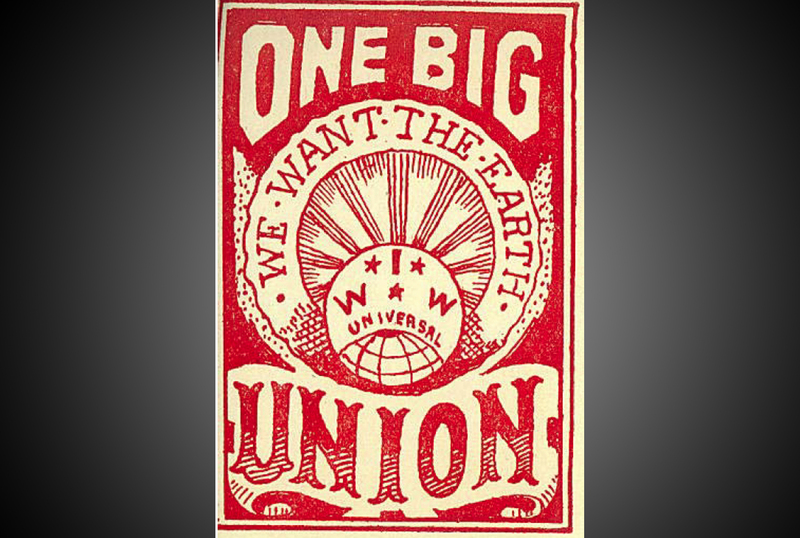 From IWW Ephemera Collection. 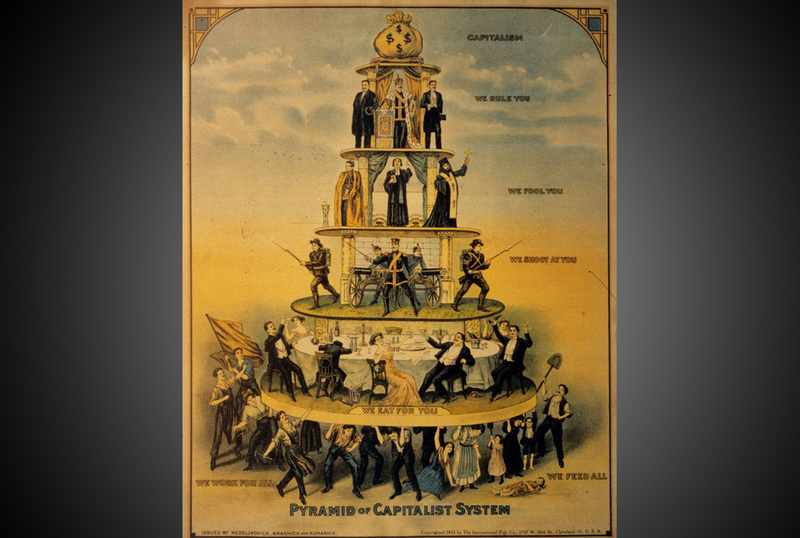 This "Pyramid of Capitalist System" poster represents society as a heirarchically tiered society built upon the backs of workers and the poor. The poster was published in the 1911 edition of the Industrial Workers of the World's newspaper. 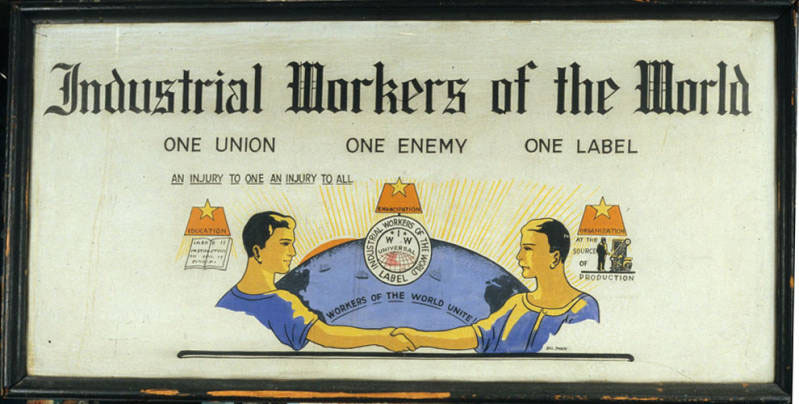 This framed sign once hung in front of the office of the Industrial Workers of the World, a radical union with deep roots in Seattle and involvement in such dramatic Northwest Labor history events as the Seattle General Strike, the Everett Massacre and the Centralia Massacre. The sign was saved when that location closed its doors in the 1960s. From Industrial Workers of the World Seattle Joint Branches Records. "Quarry Workers," 1978. Richard V. Correll (1904 - 1990) was an artist known for his prints, which reflect his lifelong concern with political and social issues and celebrated the dignity of working people. From Richard V. Correll prints and papers. Cannery workers at an Alaska Cannery, 1937. Filipino American and Asian American cannery workers organized into a union in 1933 to protect themselves from exploitative working conditions as part of a racially segmented labor force. The union has deep roots in the Filipino American community on the Pacific Coast. From the Cannery Workers Photograph Collection. 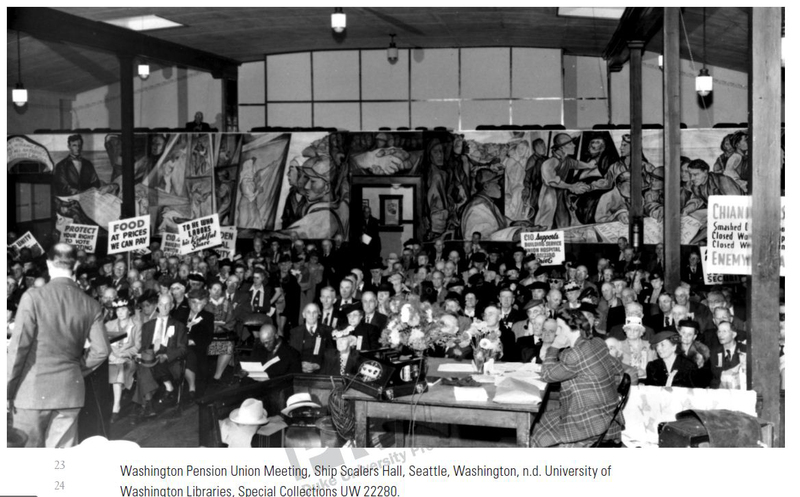 Photograph of a meeting of the Washington Pension union at the Ship Scalers' Union headquarters. The O'Higgins mural is mounted on the wall in the background. The union hall was the site of many progressive causes, including Seattle's early civil rights movement. From Washington Pension Union Records. 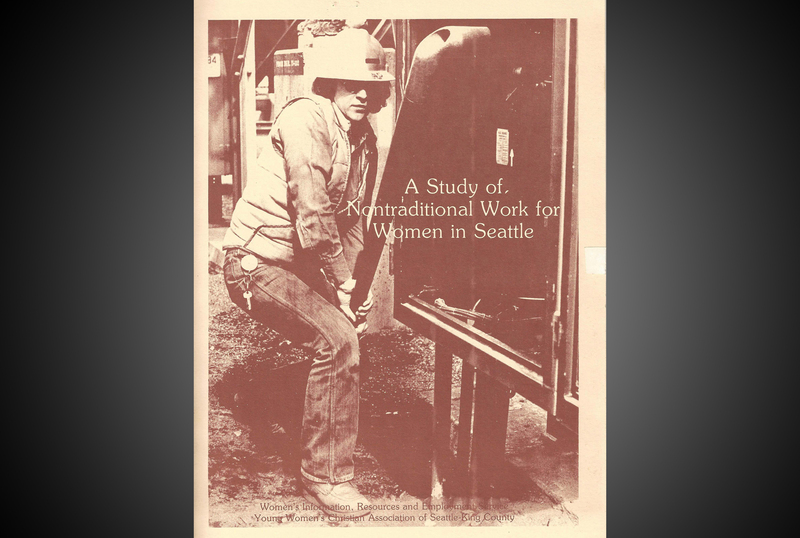 In 1978, the YWCA studied barriers for women's access to "nontraditional" jobs. Administered through a survey of local businesses and unions, the study compiled the number of women employed by those surveyed, reasons for hiring women (or not), training opportunities open to women, and perceptions of what jobs women were capable of doing. From the Tyree Scott papers. 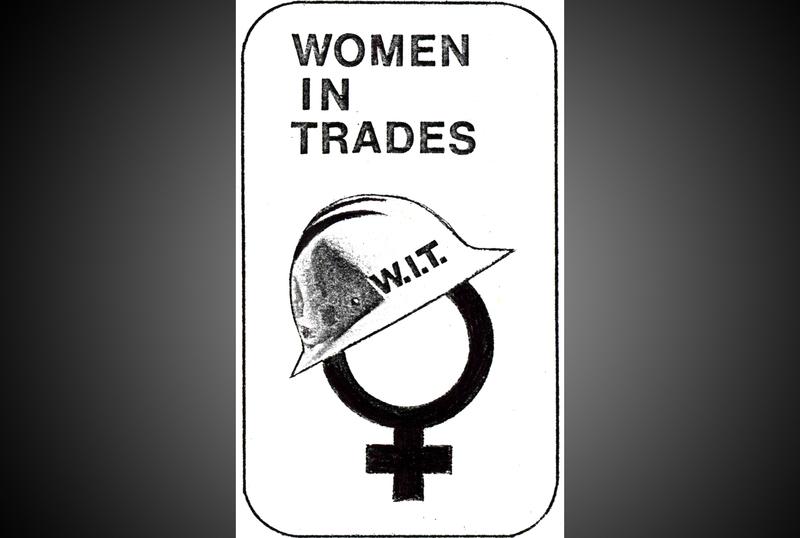 This logo from the University District chapter of the YWCA recalls their role at the site of early tradeswomen organizing, demanding equal access to construction jobs. Seattle was the site of bold, innovative and intersectional organizing between men of color, tradeswomen, and progressive communities in the 1970s and 1980s. From YWCA records in UW Special Collections. You seem a perfect fit for your job, Conor. What background in labor unions brought you to this work? I have labor history in my blood. I came to it from researching family history. My maternal grandfather was a longshore worker and union member, and my grandparents got married during the 1934 Pacific Coast Maritime Strike. My other grandfather was a union electrician, and both of my grandmothers were union workers when they were wage workers. The Labor Archives of Washington and the Harry Bridges Center will celebrate the 100th anniversary of the Seattle General Strike with “Preserving Solidarity,” an event from 1 to 5 p.m. Feb. 9, 2019 in the Walker-Ames Room of Kane Hall, room 225. Learn more. My father was an elementary school teacher and union chapter leader before he retired, so I have an awareness and appreciation of the labor movement. I was raised in a working-class household in an ethnically diverse community, so I grew up with an inclusive vision of the need to honor and preserve the history of diverse communities. 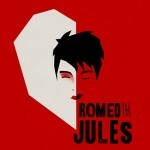 At the same time, I was drawn to this as a rich intellectual topic academically. In my studies, I pursued anthropology, history and library science as a means of understanding the culture of diverse groups of people over time and how to preserve and promote that history and culture. Having a job where I collect and preserve the stories of working people is an honor and a privilege. These people built our country. Their work has dignity and worth. This history records the achievements of working people and their organizations in improving wages, working conditions, health and safety, and on-the-job democracy. Everyone who works for a living today enjoys the results of these accomplishments, but their origins are often mystified or forgotten. People often aren’t taught about it in school. There is no forward arrow of progress to time; no guarantee that all of these rights and privileges won’t be lost if current and future generations fail to remember and honor their history and protect these achievements for the future. As well, new modes of worker organizing are constantly arising, and being aware of those to ensure that we document evolving movements is an ongoing part of our work. For more information, contact Casey at 206-685-3976 or cmcasey@uw.edu.